Much recent work by historians has highlighted the extent that medical knowledge was part of a ‘knowledge economy’ in the early modern period. Put simply, health and medicine were regular topics of conversation, whether in person or by letter. Just like today people told each other of their symptoms, suggested favourite remedies or recommended particular doctors. In some ways too, early modern people were perhaps more sensitive to their own bodies than we are today; they understood their bodies through a framework of the four humours, and had some idea of their own particular humoral balance. Also, they monitored their health constantly, ever vigilant for potentially unusual or dangerous changes. With less easy access to medical practitioners for many of the population, self-medication was the first recourse in times of sickness. It made sense to have an armoury of remedies at the ready, just in case. In literate households, manuscript collections of remedies were effectively the next best thing to a consultation with a physician. But how were these collections assembled? Where did the remedies come from? 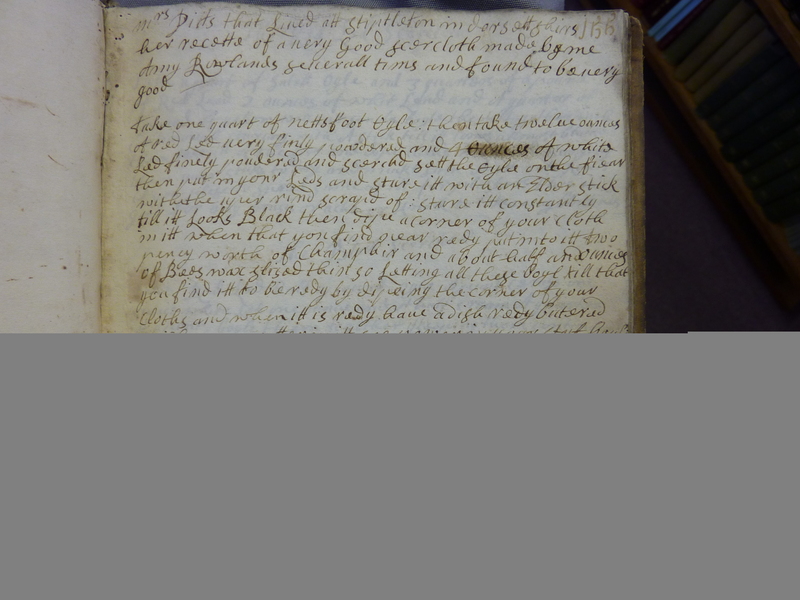 By looking at a typical eighteenth-century recipe book in more detail, we can start to see the ways that medical information travelled through social networks in early modern Britain. 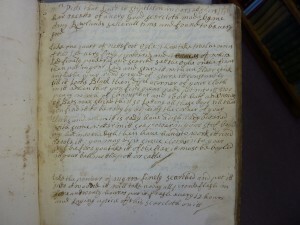 Between roughly 1706 and 1717, Amy Rowlands of the wealthy Rowlands family of Plas Gwyn, Anglesey, compiled her own book of medical and culinary receipts (available to see at the University of Bangor library, as MS Henblas A5). Her book is typical of the form. It is carefully laid out, written in a fair hand and fully indexed, following the format of a ‘receptaria’ medical book. The image below is from the first page of the book, where Amy seems to be trying out a few writing exercises, based on a moral pnemonic. Amy’s book contains more than a hundred recipes for a variety of conditions and using a wide range of ingredients. This one, “for the stone”, is fairly typical. “Dry the roots of Red nettles and make them into pouder and drink a spooonfull of the powder thereof in a draught of white wine something warme and it will break the stone though itt bee ever soe great. And that with speed use it every day until the stone and gravell be all broken and consumed, A thinge of smale prices and great virtue”. ‘To make Ginger Bread with honey Madam Griffiths way’‘To make Ginger Bread the best way Cosen Sidney Rowland is way’. “Madam Griffiths is more difficult to trace, but ‘Cosen Sidney Rowland’ lived in Dewis Bren near Llangollen, and therefore in reasonably close proximity to Amy. “A Reciept for a Consumptick Cough” was provided by “Mrs Jane Williams of Ty yn ystrithsons”, clearly another acquaintance, as was a recipe for “flower water” attributed to Mrs Griffiths of Carnarvon – again, in very close proximity to Amy’s Anglesey home. Take of the bark of Ash of the tender twigs of tamarisk of each two ounces of the same of Brooklime: scurvy grass, Liverwort, Hartshorn, Agrimony: Sage of each one handful: of Sene three ounces. Bruse all these and infuse them in seven quarts of smale(?) ale: after 24 hours you may drink of itt about half a pint furst in the morning and last att night you may ad quince seeds Brused to correct the wind if you please”. For me, these records are especially interesting. Firstly, and obviously, they confirm that Amy sought the help of a doctor – one ‘Dr Humphreys’. Receipts attributed to doctors often appear in remedy collections, without the author having necessarily ever consulted the physician in question. Hence can be found remedies such as “Dr Butler’s receipt for the plague water”, noted in several collections from Wales at this time. 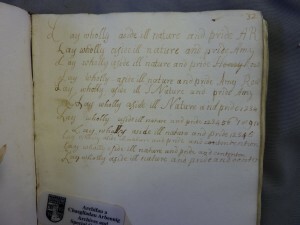 The inclusion of the title leant provenance and value to the remedy, especially if it had a positive reputation. 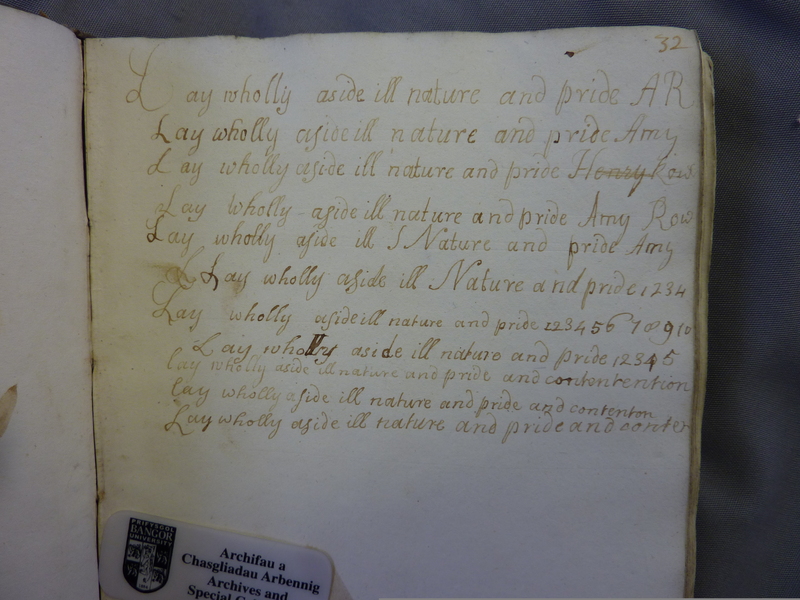 Amy’s note here, however, strongly suggests that she had met (or perhaps consulted by post) this “Dr Humphreys”, and she recorded his directions for future use. Locating Humphreys is difficult given the commonness of his surname, but he was likely a local practitioner or apothecary, and unlikely to have been licensed. Indeed, Amy Rowlands was seemingly not overly concerned about the ‘professional’ credentials of a practitioner; it was the reputation of a remedy that mattered more. A remedy for a ‘Meigrim in the head’ is included, attributed to “Pembrockshir Bess” – perhaps a cunning woman or magical healer. Sources could, though, also come from much further afield, and suggested spread by word of mouth, rather than personal acquaintance. The remedy below is attributed to “Mrs Pitt who lived in Stippleton in Dorsettshire” and is a receipt to make “a very good seercloth”. Amy included a note that she had made this recipe herself, and found it good – perhaps the best indicator of its reliability. The efficacy of a remedy, though, was not just based on whether it had cured the author of the collection; the opinions and testimonials of others were just as valuable. In this example, the benefactor of the remedy was “Mr Moris Owens’ who perhaps (although by no means certainly) knew the ‘Captain Fitspatrick’ upon whom the initial remedy was so successful. Here, the remedy had travelled a physical distance (from London to North Wales), but had also moved through a social network by several removes, connecting people who otherwise had nothing to link them. It is this last point that really highlights the value of these fantastic sources. They certainly reveal much about medicines, ingredients and the physical processes of manufacturing remedies in the early modern period. But, in cases where authorship and attributions are known, they also reveal much about the diversity of sources of medical information and the sheer wealth of medical knowledge that was available. Far from being helpless in the face of sickness, people in fact were surrounded by potential sources of relief. Recipe collections offer us a unique insight into this process. Apologies for cross-posting. This post appeared on my own blog: dralun.wordpress.com (19 July 2012).